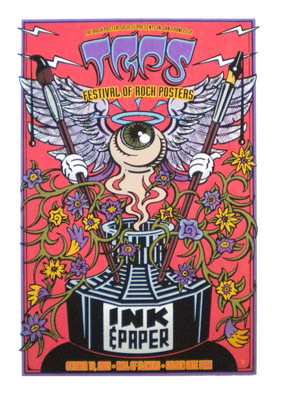 Bay Area rock poster art contemporaries Chris Shaw, Chuck Sperry, & Ron Donovan stand out amongst their predecessors in the Bay Area tradition of poster making that spans nearly 50 years. Through their prolific bodies of work, the masterful artists have brought inno­vation, invention, and new meaning to this art form. Each distinc­tively fuses propaganda, imagery, text, and historical art references with Pop and rock-poster art sensibilities to create accessible, relat­able imagery that is at once empowering and undeniably populist. A collaborative art work involving three individually created window installations, Donovan, Shaw, and Sperry layer silkscreen, painting, collage, and mixed media to transform two-dimensional imagery into three-dimensional expression. Showing reverence for man’s commu­nicative nature, they reference the renewal of the idea that art has a purpose. Temporally Bound is a “visual improvisation” between Sperry and Shaw. Its form is drawn from the Asian accordion-style bound scroll to recognize the Pacific Rim as the gathering center of the art world and to emphasize post modern appropriated multiculturalism. 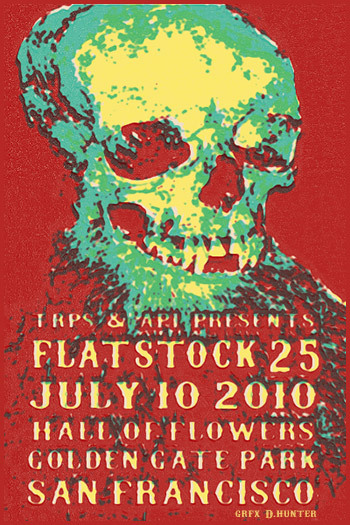 Sperry and Shaw express a realization of the temporal, time-punctuated nature of street and poster art. By binding the panels together in monumental book form, the artists create a visual record of events through a modality of time. Additionally, through binding invention, the contextualization of visual imagery, and a reassigning of repre­sentational meaning, the artists transform ephemeral events and experiences by creating a lexicon of a shared cultural visual memory. The “Windows Program” uses the SFMOMA Garage’s street-level win­dows located at 150 Natoma and 147 Minna Street (between Third and New Montgomery Streets) to showcase artwork. The program, organized by Renée de Cossio of the Artists Gallery, invites some of the area’s most ambitious artists to transform these every day spaces into compelling exhibitions that the passerby can view round the clock.